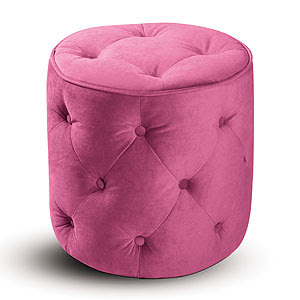 In my efforts to keep you up to date with all things pouf and ottoman related, be aware that World Market now has these for $90. And these for $39. 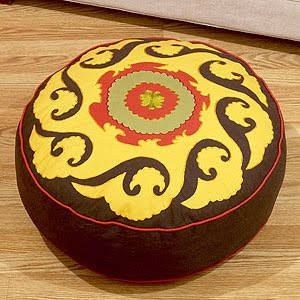 Fulfill your pouf and your suzani craving in one product. That tufted pink one is supercute. Also like that it's a bit taller. The bottom one is so pretty! Really - World Market? Great -I'm going there this weekend. I'm tired of the hubby using my coffee table as an ottoman. Nice. I need that top one, I'm going pink in the living room. Can I just tell you that I LOVE your blog! I went back and read a bunch of your posts over the weekend, and trust me, I follow a sh*tload of blogs, yours is tops. Love. One of those pink poufs with a steel bar through the centre (safety) and a round glass top attached to it would make a fine coffee table, fit for Southfork.